Each year we conduct a survey on how educators are using blogs. 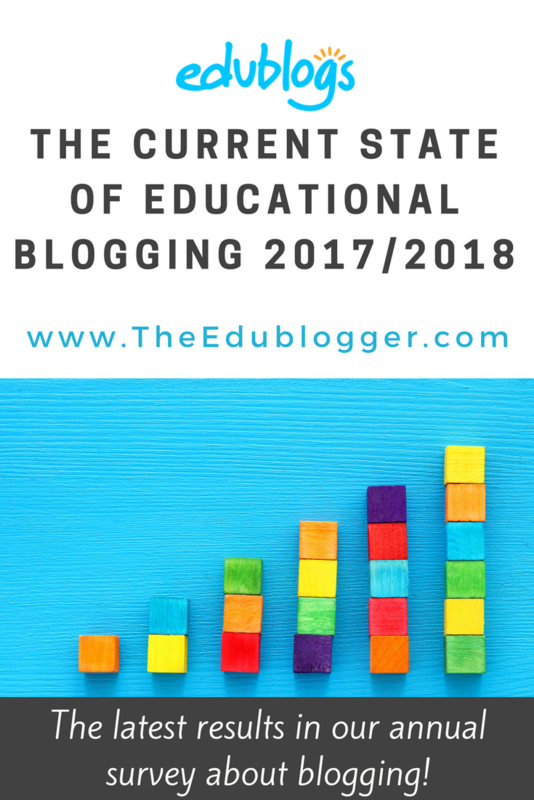 Our goal is to document the trends in educational blogging. Convince school administrators to allow blogging. Understand the benefits of blogging and how blogs are used with students. 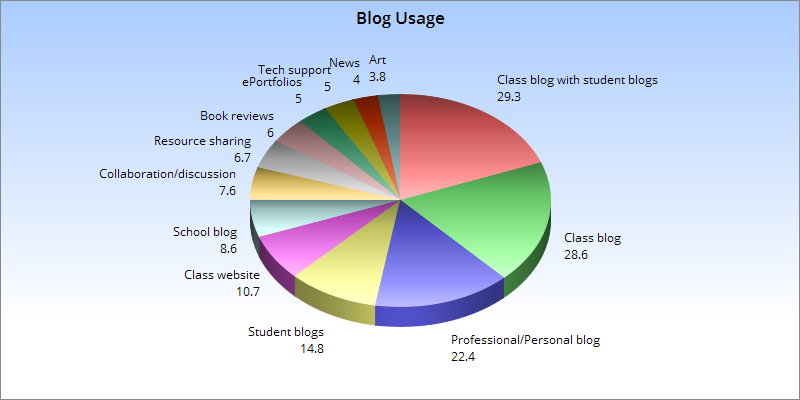 Know more about which blogging platforms are commonly used by educators (and why). This post summarizes what you told us in our sixth annual survey. For simplicity, we’ll refer to this report as the 2017 survey despite the survey being open from November 2017 to April 2018. All of the figures stated in the charts are percentages. Some of the percentages for various questions don’t add up to 100% because some people chose multiple options. We understand that this report only provides a snapshot of how blogs are being used in certain communities and doesn’t necessarily reflect true global trends. We invite you to add your own insights in a comment. No time to read it all? We’ve summarized some key findings below. Read on to find out more about the results! 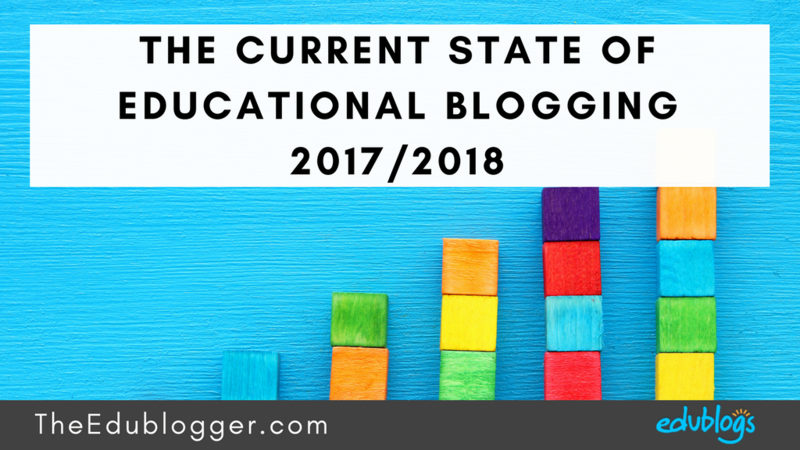 This is our sixth annual report of the state of educational blogging. Dates: This year’s survey was conducted from November 27, 2017 – April 19, 2018. Responses: A total of 420 respondents took part in the survey (down on previous years). Promotion: The survey was promoted via Twitter, Facebook, two posts on The Edublogger, our email newsletter, and notices in Edublogs users’ dashboards. Platforms: We encouraged replies from educators regardless of the blogging platform they use (while understanding much of our audience use Edublogs). We started by asking about the respondents’ backgrounds to learn more about their role and their educational institution. Note: Respondents were able to select more than one checkbox for many questions which is why the results for some questions add up to more than 100%. The majority of the responses were from teachers (54.6%) followed by students (22.7%). Most were based at public schools or institutions (75.6%). Nearly a third were based in high schools (31.4%), followed by elementary/primary schools (28.6%), and middle/junior (23.8%). We asked how long our respondents had been blogging. There were many respondents who are fairly new to blogging. 24.3% started blogging during 2017 and 17.9% only started blogging during 2018. This year was the third time we asked the respondents where they lived. 61.7% of the respondents were based in the United States, followed by Australia (10.2%), Canada (7%), and United Kingdom (4.5%). There were a small number of responses from people located in other locations including South American, African, Asian, European, and Middle Eastern countries. 51.5% of respondents were based at schools/institutions that have (or will soon have) a one-to-one device program. The number of schools with one-to-one devices has remained steady over the last three years. 51.5% indicated they had 1:1 in 2017 compared to 51.6% in 2016, 52% in 2015, 44% in 2014, 45% in 2013, and 41% in 2012. 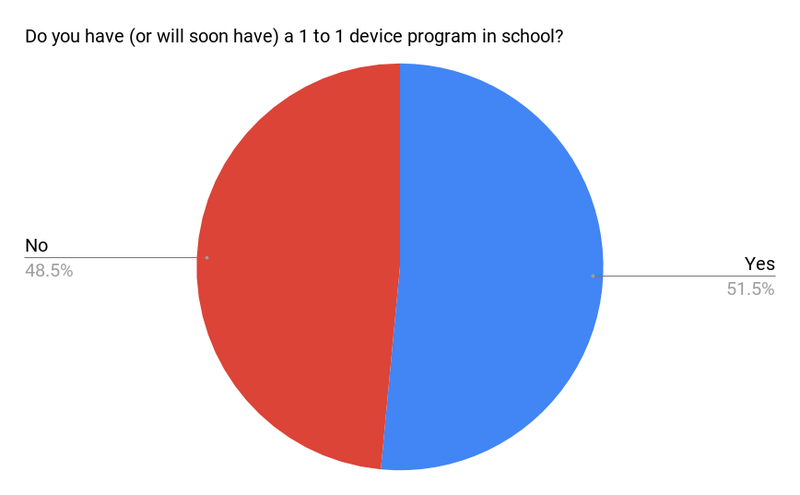 This year was the fourth year we asked respondents if their one-to-one device program was BYOD (Bring Your Own Device). BYOD programs make up about one third of all one-to-one programs in schools currently. 34% of those who indicated they have one-to-one devices are part of a BYOD program. 66% of one-to-one programs have devices provided by the school or district. 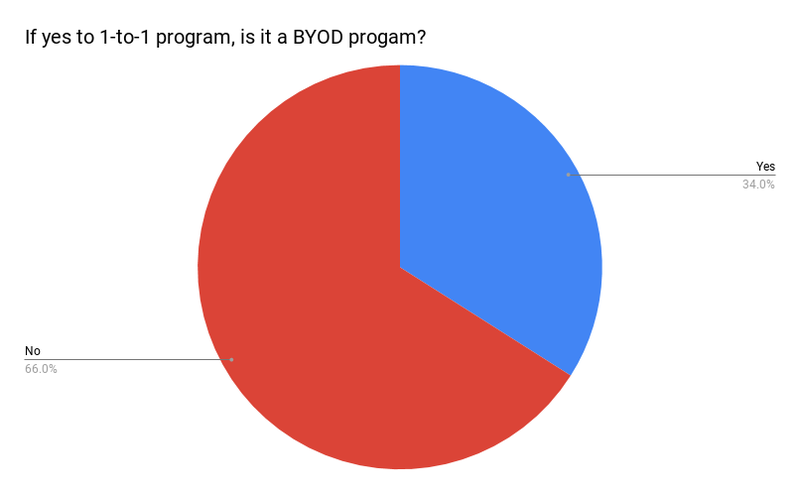 The following chart demonstrates how this figure has varied over the last four years that we’ve asked respondents whether their school’s one-to-one program is BYOD. The following graph summarizes the types of devices currently used in one-to-one programs. The 12% of “other” responses were mostly phones or other tablets brought from home. iPads peaked in popularity in 2014, but are now back to the 2012 level of 27%. The use of PC laptops has slowly decreased over time from 45% in 2012 to 31% currently. There has been a slight decrease in the use of Mac laptops (32% in 2012 to 19.7% currently). There has been a steady increase in the use of Chromebooks each year and these are now the most popular choice for our respondents. It’s important to note that 61.9% of people who responded to our survey are from the United States and there is perhaps more of a trend towards Chromebooks there than in some other countries. Next, we looked at how respondents use their blogs. The majority of respondents told us they mainly use their blogs for class blogs with student blogs (29.3%) or class blogs (28.6%). Other popular uses are professional/personal blogs (22.4%), student blogs (14.8%), class websites (10.7%), and school blogs (8.6%). Class blogs have stayed roughly the same (28.6% this year compared to 31.5% last year). There has been a 10% increase in class blogs with individual student blogs (up from 19.2% in 2016). The number of personal/professional blogs has increased from 15.7% in 2016 to 22.4% this year. 53% of respondents told us they had (at least one) individual student blog/(s). The number of individual student blogs supervised by educators varied considerably from just one or two, up to approximately 400 blogs. Based on student blog usage from Edublogs.org, 50.6% of student blogs are public and can be viewed by anyone and 49.4% of student blogs are private restricted to specific readers. There has been a 1% decrease in the number of student blogs that are public since this time last year. Based on Edublogs statistics, 26.6% of educators moderate all comments on student blogs while 20% moderate all posts on student blogs. Posts/comments on these student blogs aren’t published until checked and approved by a teacher. You can read more about the issue of public and private blogs in our post on The Edublogger from January 2018. When asked, “What is the main reason you use student blogs?” there were nine popular answers. 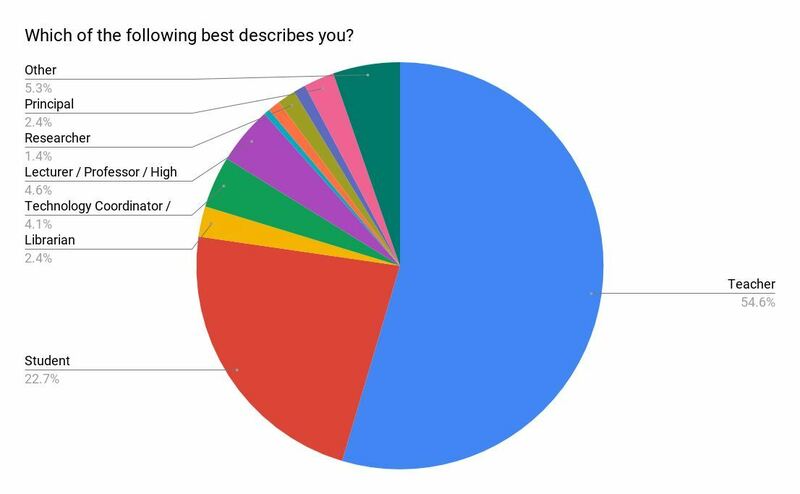 The 12% that makes up “other” responses included: because students were required to have a blog for their subject, for fun, to connect with parents, to organize resources, or to showcase art/music etc. The top three reasons for using student blogs in 2016 were assignments/assessments (34.3%), reflective blogging (29.6%), and collaboration/discussion (32.6% ). Overall, there hasn’t been a significant change in the reasons for using student blogs over the past 12 months. When asked, “What is the main reason you use a class blog?” there were seven popular answers. The 8.5% that makes up “other” responses included: sharing with other educators, reflection, and specific projects (e.g. passion project, PBL, science fair). The top three reasons for using a class blog in 2016 were assignments and class news (42.7%), sharing information with families (37.3%), and sharing links and resources (33.1%). This hasn’t changed significantly over the past 12 months. The following benefits and insights into blogging were summarized from the 2017 survey responses. Click here to find a more detailed summary of responses aggregated from previous years if you want to read more about the benefits of blogging. Weekly blogging was started in response to poor writing scores on our state assessment. Weekly blogging has turned into a way for students to share themselves and their ideas that formal writing curriculum often doesn’t make room for. I have watched students blossom as writers in a few short months; and I have learned things about my students that I would not have the opportunity to know otherwise. I anticipate this helping raise our scores and graduating more confident writers to the high school. At the University level, I use blogs as an opportunity for students to share their opinions about teaching and learning, so that future employers can look at their work and see that they are good communicators, have a voice and opinion, and are passionate about their career. I used to do a weekly paper newsletter; grateful to have an easier way to manage class news, photos, and showcasing of student work. I read this somewhere on Twitter I think: “Stop saying hand it in. Start saying publish it” Great advice. (Edit: This is a quote from Alan November). Blogging and reading other people’s blogs has opened up a whole new learning experience for me – I highly recommend it! The sense of accomplishment and a feeling that their thoughts/ideas really matter for our 6th Graders encourages us to continue supporting our student bloggers. Their writing and thinking skills are enhanced through the Blogging Challenge they partake in twice per school year. It is a great way to show students authentic writing and to teach proper ways to comment. It also exposes students to something other than texting or Facebook as a way to interact with others. I wrote about my experience teaching and blogging with students for the January 2018 issue of NCTE’s English Journal; I found that blogs can be a tremendous support for research-based writing instruction (workshop approach, peer feedback, authentic audience, low-stakes practice, reflective writing, etc.). I frequently find that students who are reluctant to raise their hand and take part in a verbal class discussion become more “vocal” when posting on a blog. I think a “teacher blog” is a great way to connect with parents, as well as demonstrate to students what a blog should look like; using “student blogs” has allowed for the opportunity for students to be creative, while reinforcing digital literacy skills and emphasize good digital citizenship when commenting and collaborating. Blogging is one of the key ways that I’ve made connections with other teachers/classrooms and has greatly improved my way of teaching over the last 8-9 years. It allows for students to have an authentic audience. I’ve been a LA/writing/Journalism teacher for over 20 years, and this has provided the best writing results of anything that I’ve used before. They know that their peers, as well as the teacher, are going to read their writing. I also provide comments on their posts that are also public. (I go to Edit, and simply add my comments at the top of their post.) In addition, the blog looks professional and digitally authentic, and I love that you can customize it. It gives me freedom to be creative in the dissemination of information beyond the constraints of the school platform/website and to speak to students on a more conversational level which is much more attractive and fun! I am very happy that my limited English students in my ESL writing class are all (finally!) using my blog. Currently it’s still primarily for basic information, but there are so many possibilities now that they have gotten their feet wet. I’ve written my own take on the advantages of blogging a number of times. 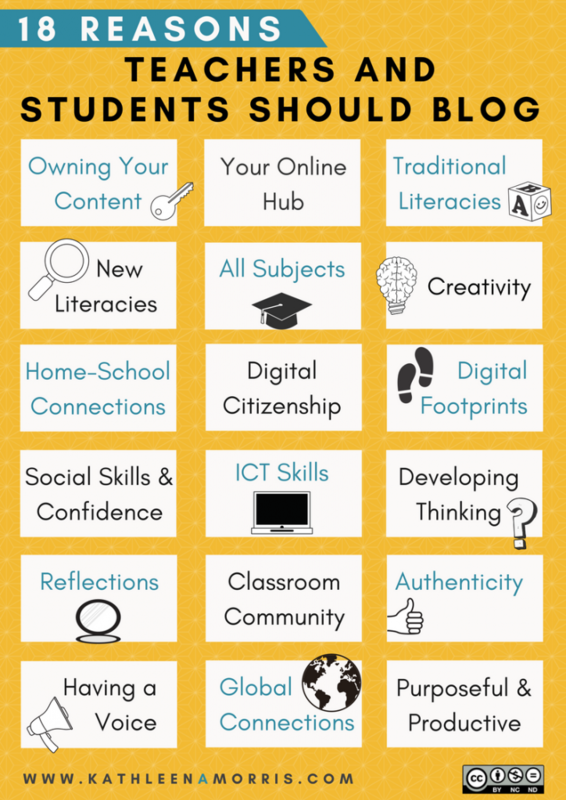 You might want to check out Why Teachers And Students Should Blog: 18 Benefits of Educational Blogging for some more insights from my own perspective. 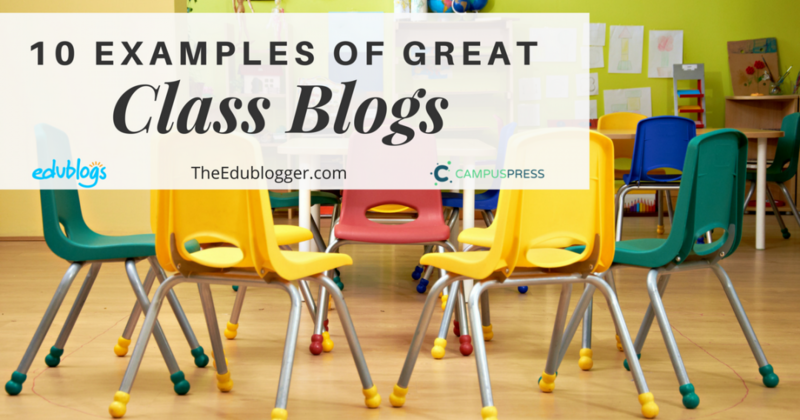 Interested in exploring how class blogs are used? Check out 10 Examples Of Great Class Blogs which was published on The Edublogger in January 2018. Linda Yollis has had a class blog since 2008. She has created a few videos with her students to document and share their process. The Edublogger class blog list – includes Maths, Science, English, History, LOTE, EFL/ESL, Library, School news blogs and more! Interested in investigating how student blogs are used? You might want to check out Different Approaches To Using Student Blogs And Digital Portfolios which was published on The Edublogger in October 2017. Watch The Possibility of Student Blogging by Andrea Hernandez and Silvia Tolisano. Watch these Grade 8 students talk about the benefits of blogging. To learn more about the benefits of student blogging in higher education watch this video by students from the University of Western Australia. To learn more about the benefits of blogging for ESL students watch this video by CCEB Blog Cairns. If you’re interested in starting your own blog, you might want to work through our free, self-paced course on personal blogging. Think you don’t have anything to write about? Remember that something that is ‘Obvious to you may be amazing to others‘. The following blogging tips were summarized from the 2017 survey responses. Click here to find a more detailed collection of responses from previous years if you want to read more blogging tips. Be sure to use Twitter and/or other social media to draw viewers to your blog. The fact that I comment on the 100 Word Challenge has been followed with interest by my young students. (Find out more about 100 Word Challenge here). I really got familiar with blogging personally, both in a learning related field (i.e. learning for work) and also hobby related – before I encouraged students to blog, so that I could relate to some of their questions a bit more directly. I know I need to blog more! The Edublogs Student Blogging Challenges are wonderful. I connected with other students all over the world! (Find out more about these challenges here). I have my students blog about current events, so that they have choice in what they write about and a more formal way to integrate digital citizenship and news into our history curriculum. If you are new to blogging, don’t be intimidated. You don’t have to have the flashiest blog or the one with the most cutting edge stuff. Choose things that appeal to you and express parts of your personality. Just jump in and get started. Your content areas will naturally grow with time, and you will continue to find new ways to utilize your blog. It will go from being a chore to being fun for you. It’s great to start your own personal or professional blog, adding to it regularly, because it gives you the skills and confidence to then branch out and use blogs in the classroom (or assist students with their own blogs or web skills). Global Read Aloud is great, and I have had students blog about the book this year and last year. Didn’t get a lot of comments/connections this way, though. Include a feature that encourages people to look at the blog frequently. I ask a music question each week, and start each lesson going over the answer and who the winner was as well as the question for the next week. We need training inside our professional hours, real professional training in our discipline, time to experiment. I love blogging with my students and colleagues, I have to use my free time to build and discover how to blog. I love The Edublogger for the tips and videos they share, they are so useful. My skills in blogging really come from The Edublogger and WordPress. I would not have felt prepared enough for this had I not started my own personal blog over the summer. It was a chance for me to see what WordPress was all about, what the blogging genre is all about, and troubleshoot the areas students may have the greatest struggle. Most respondents use Edublogs as their primary blogging platform (74.3%). This was followed by Blogger (6.5%) and then WordPress.com (5.0%). 2016 results were: Edublogs (59.4%), Blogger (13.6%), and then WordPress.com (7.8%). Given that the survey was shared with all Edublogs users, we know this doesn’t accurately reflect true usage statistics across education in general, but the survey was open to users of all platforms. It’s quite common for educators to host their blogs on more than one different platform. Almost half of our respondents indicated that they use an additional platform. Edublogs (19.3%) was the most common secondary blogging platform used, followed by Blogger (12.2%), and WordPress.com (10.6%). 2016 results were: Edublogs (27.6%), Blogger (15.2%), and WordPress.com (12.2%). When we asked respondents why they use Edublogs, the major themes were: personal support, ease of use, free/affordable, school/department approved, privacy settings and managing student blogs, made for education, built from WordPress, safe, and recommended. Been using it a long time, reliable, great support. Very user friendly and conducive to classroom needs. I have some experience using WordPress. Safe for students and easy to manage. I feel students gain more advantage for future career opportunities with a basic understanding of WordPress. Reliable, easy to use, great back up and support, visually pleasing. The district does not block it. I have used it for years… simple… all my material is organized and easy to pull up quickly. Long time user and love the support and platform you have created. Edublogs is a Community; there is plenty of sharing, help and support and we are encouraged to blog through comments. Student centered, safe and relatively easy for the students to use. Edublogs was a good starting platform in which to have the students build their own authentic blogs that look like what they will see in industry. It has many features I appreciate and is education-oriented. I have always appreciated the Edublogs support, Teacher Challenges and Student Challenges – a great way to learn and explore blogging. I love the security! Nothing comes into my students’ blogs or goes onto my students’ blogs without my knowledge. I chose Edublogs because it provided excellent support resources and gave me the ability to moderate the whole process—from what my students posted to the comments made on their posts. I also liked being able to provide faculty and families with a link and a password. As this was my first attempt at student blogs, these steps made me more comfortable with putting my students’ work “out there” while still providing a safety net. I started with a Weebly blog and website. Edublogs seemed more education oriented and when I learned you would be offering a free course on blogging, that sealed the deal for me. Communication and less photocopied paper. I really like how easy it is to customize. It’s beautifully put together and feels super professional. My students are all impressed with how “fancy” it is (in their terms). I love it because it enables me to do everything I need to do with ease and do it in a way that looks professional. It works well for class blogs. We are in the lab and they all can post at the same time, etc. Students within a class can be “linked,” it’s free, ad-free, you don’t seek to have search engine crawling, it helps students learn to express their ideas. Serves the education community; based on WordPress; LOVE the support personnel! It was the easiest to manage and was in student friendly language and accessibility. It offers good support, it’s free, it’s ad-free, and it’s safe for my students. It’s simple to use. Safe; user-friendly; reliable; great support and advice; belongs to the Australian education profession and allows me to connect/collaborate with this community; looks great; huge capacity; extends my own digital skills and learning; enables me to easily, safely share with students to model good digital citizenship and share important resources. (Thank you, by the way!) My students don’t edit it, I’m the only administrator/editor, but it’s been fantastic. It’s also allowed me to build up work annually, then to archive pages and easily retrieve them in following years. It’s super easy for students to access for viewing purposes only, and they love it. My librarian was using it and was able to show me how. Price is reasonable and it mainly does what I want it to do. 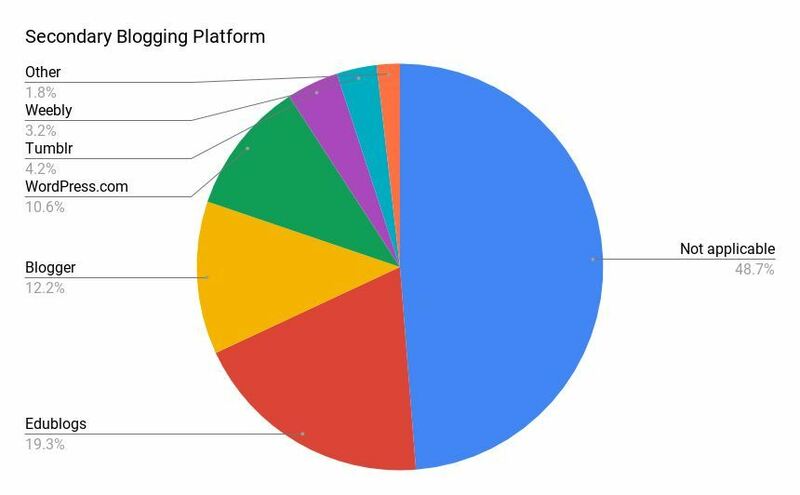 When we asked respondents why they use Blogger, the major themes were: ease of use/intuitive, free, associated with Google, and history of using the platform. It’s so simple to use it! First discovered, first used; in my mind, Edublogs platform is more adequate than Blogger but less known in my area. I started blogging in 2005(ish) – it was the best most customizable platform at the time. I’ve been happy with the changes over the years to it and it’s still a great user-friendly platform. 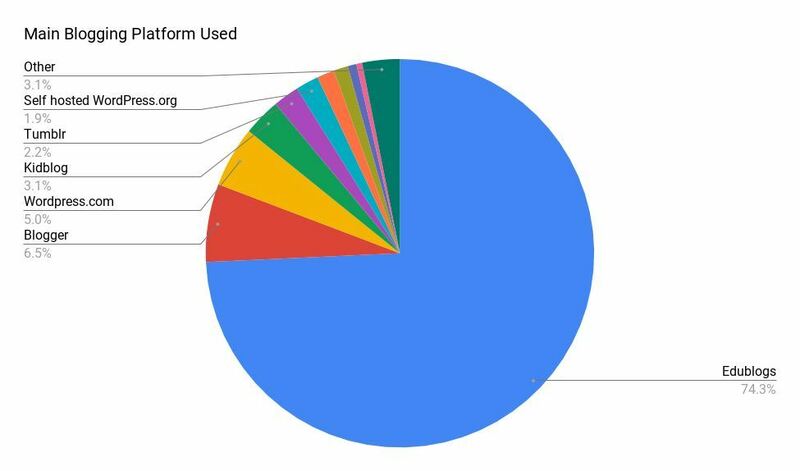 When we asked respondents why they use WordPress.com, the major themes were: school/institution choice, free, easy, and history of using the platform. It was fairly easy to set up, and there are many customization options. Also, students could benefit from familiarizing themselves with the platform, in case they ever need to use WordPress on their own. Also use Edublogger (Edublogs), but WordPress has more options, allows more widgets and customization. I first made my personal blog on this account after searching online for most popular blogging websites. 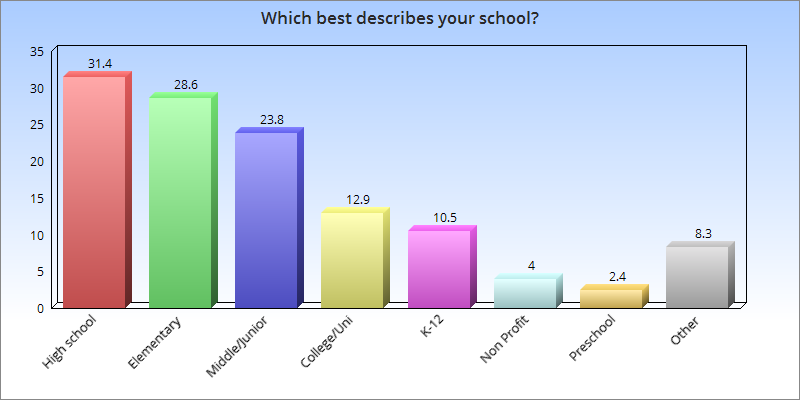 When we asked respondents why they use KidBlog, the major themes were: ease of use, features, school approved, and cost. I use Edublogs for my own blog, but prefer Kidblog for my students. I needed something that worked with first time bloggers. It was also affordable, I often pay for memberships out of pocket. Our district encourages us to use Kidblog. This may now change to Edublogs. To allow students to share and collaborate about their art with peers and parents and on a social platform; to teach digital literacy and digital citizenship; authenticity and ability to control the level of visibility of the blogs (student/class/public). The ease of housing everything under one “roof” with complete teacher control. The small number of responses recorded on why Weebly was chosen as a platform mostly revolved around simplicity, cost, and ease of use. It looks modern and clean, and has nice options for website templates. Very simple to use and had lots of options regarding formatting and font/color choices for text. The small number of responses recorded on why Tumblr was chosen as a platform mostly revolved around simplicity, fun and entertainment. Want To Get Started With Blogging? If you, or someone you know, wants to get started with blogging, we have lots of resources to help. 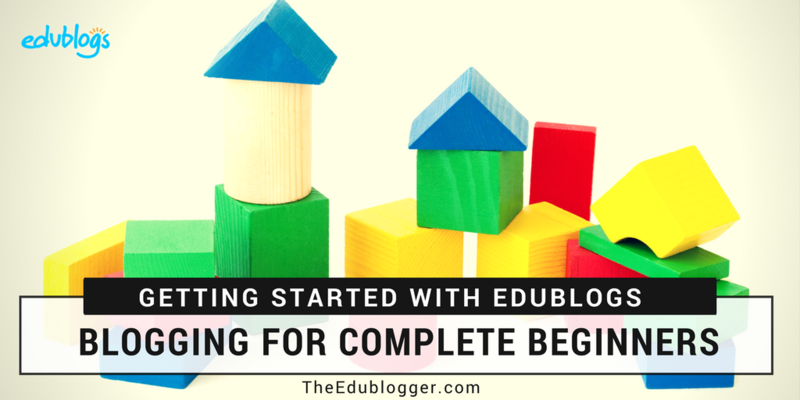 Blogging For Complete Beginners: Getting Started With Edublogs is a useful guide if you’re new to blogging. It includes a 15 minutes quick start video. Our Teacher Resource page also summarizes where to find the guides on the topics you’re after. If you need additional help, leave a comment, or email us! We provide free 24/7 email support to everyone. What other questions would you like us to have asked? What’s your take on some of the results? 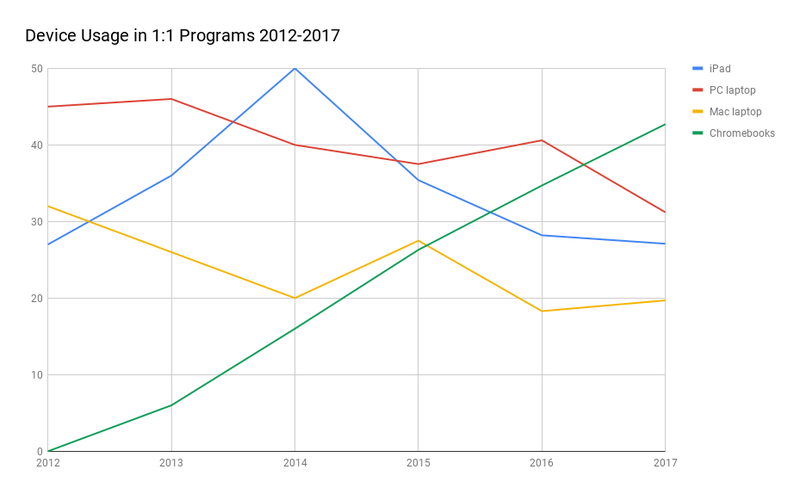 For example, why are we seeing a trend towards Chromebooks as the device of choice for one-to-one programs? Any predictions for the future of blogging? Have you noticed any trends in your area? And to all of you who took the time to take part in our survey, we’d like to offer you a big thank you! We appreciate you. Great to get started. Hoping to have my students participate in great blogging challenge. I set up my edublog earlier this school year and then basically ignored it for the whole school year. I have recently attended inservices on the use of blogs in classrooms and am now interested in using my blog over the next few weeks of the school year and over the summer to get more familiar with it. I would like to use it next school year in some of my classes. Could you share with me some resources to help me guide my students in setting up blogs? I want them to be able to document their notes, post assignments, set up their own resources, have guided discussions, etc. Great to hear you’re keen to get started with blogging again. Summer can be a great time to explore. We have a range of free self-paced Teacher Challenge courses that might be helpful for you. There’s a Blogging Bootcamp course your students can work through too. One final thing to look at is the Student Blogging Challenge. This is just wrapping up but will be back in October. It was a pleasure to read this stuff. Thanks for info! Thanks for all the great resources you provide for educators, Cindy! i think my school should have a class in blogging. some people want to blog more then we do. i agree. i think blogging is a very good exercise. yup. and it extends everyone’s skills to share their thoughts, opinions and learnings.